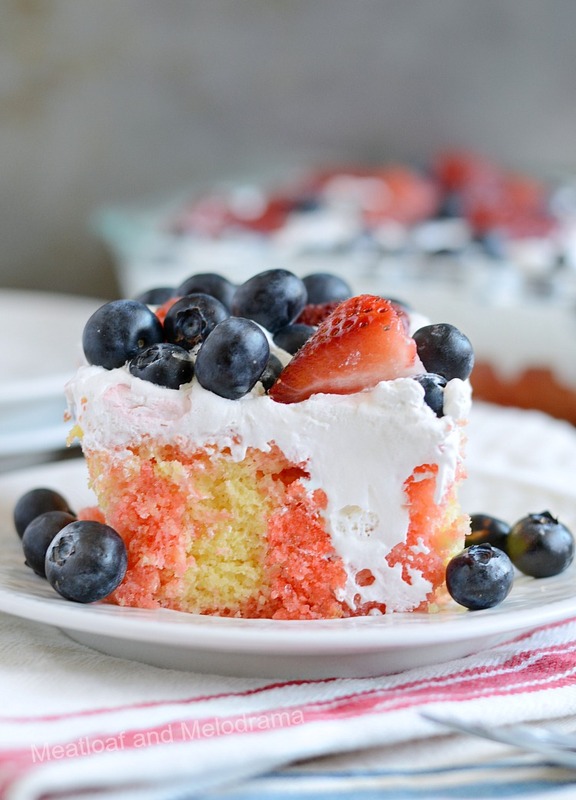 This Red White and Blue Poke Cake is filled with strawberry Jello and topped with fresh strawberries and blueberries. 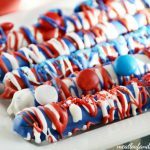 It’s an easy summer dessert that’s perfect for the Fourth of July or any patriotic holiday! 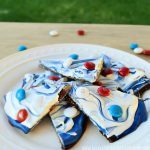 We usually make a red white and blue flag cake for an easy 4th of July dessert every year, but on a whim, we made one for Memorial Day dinner this year. 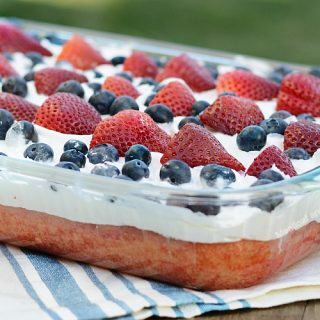 It’s one of our favorite red white and blue desserts. This time, I changed the design so that everyone could have plenty of blueberries and strawberries with every bite! This patriotic poke cake isn’t a new idea, but since we make it every year, I thought it was about time to share it with you guys! 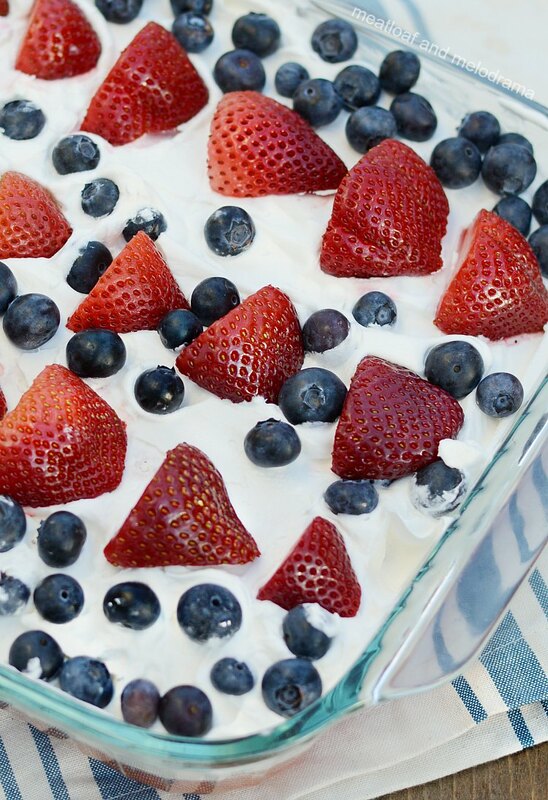 You’ve probably seen the usual 4th of July flag cake recipe, topped with Cool Whip and blueberries and strawberries, right? Well, the only problem with that design is that not everyone gets blueberries. And if you have kids, you know that can be a problem! So, we finally changed up the design this time by adding rows of fresh blueberries and strawberries. This way, there’s plenty of fruit in every bite, and everyone is happy — for one night, anyway! I love making poke cakes — They’re super easy and fun. Actually, they kiddos have pretty much taken over since they love poking holes in the cake! For this patriotic poke cake, you bake a cake with help from a box of yellow cake mix. You can bake one from scratch, although I usually use cake mixes for poke cakes to keep things easy. After the cake cools, you use the handle of a wooden spoon or wide straw to poke holes in the cake. 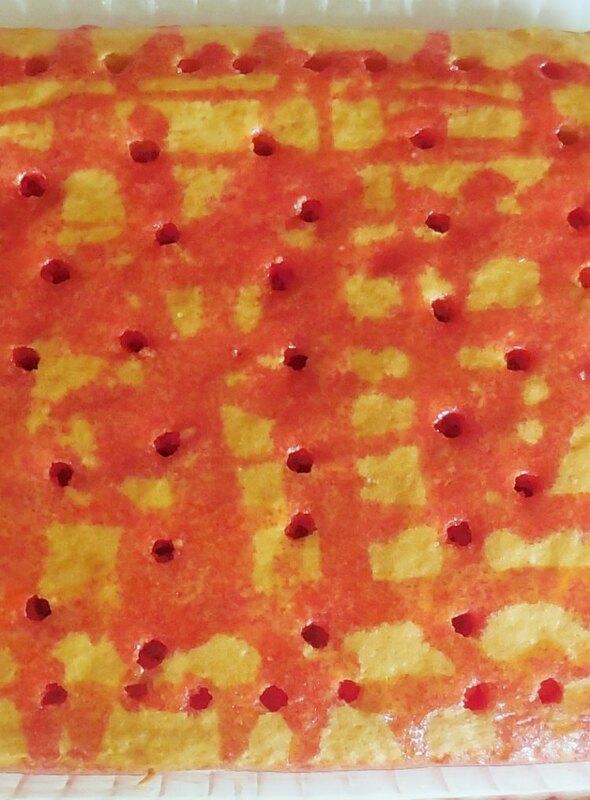 Then, you mix some Jello and water, and you pour the mixture into the holes and over the cake. I used strawberry Jello, but you could also use blue gelatin. Let the cake cool off in the fridge, and then frost it with whipped topping, and top it with sliced strawberries and plenty of blueberries. If you make rows of strawberries and blueberries, each slice of cake will have plenty of fruit on it. So, nobody can complain that they didn’t get any blueberries with this cake! 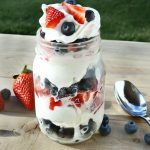 Looking for more patriotic red white and blue recipes? 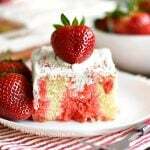 A red white and blue poke cake filled with strawberry Jello and topped with strawberries and blueberries is the perfect easy dessert for the 4th of July or any patriotic holiday. 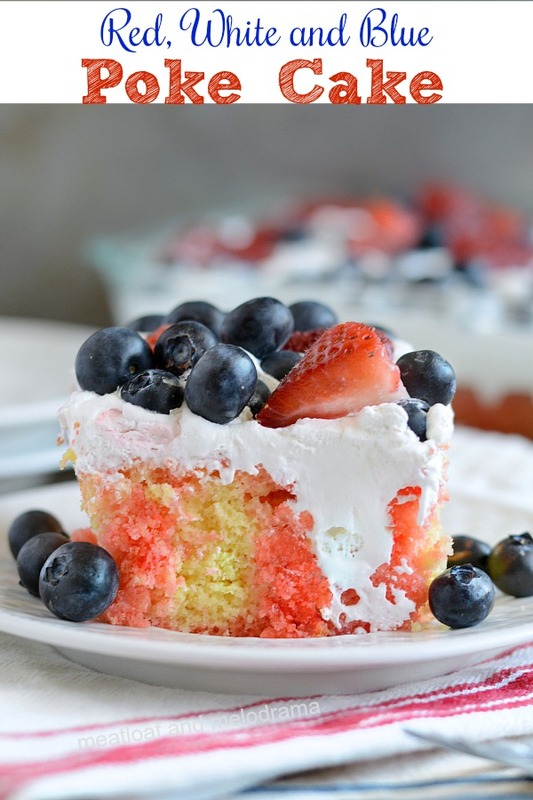 I hope you enjoy this easy red white and blue poke cake recipe as much as we do! So fun and festive! Perfect for 4th of July! Thanks so much! It sure is! Jello poke cakes are so fun to make! Perfect festive dessert for the summer! I love this for 4th of July! So perfect!! This looks delicious! Loving the gorgeous fruit on it! So perfect for the 4th of July! And so yummy with all those berries!! Perfect for the 4th! Love a good poke cake! Such a lovely colors! Craving for this! 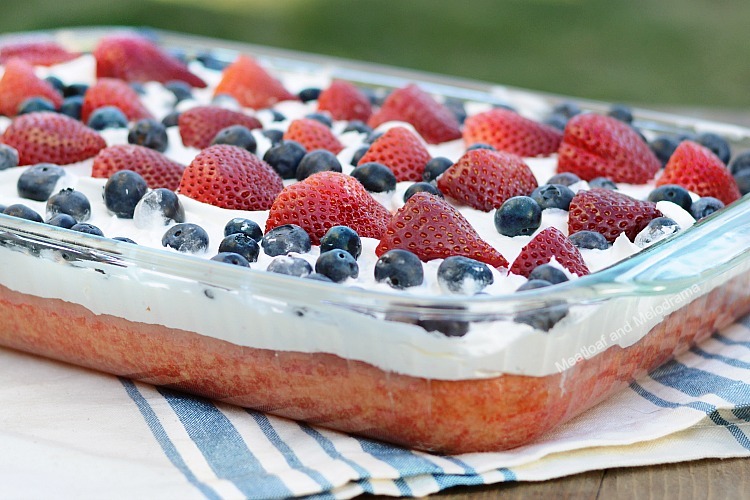 This will be a great dessert for the 4th celebration! Hope you are having a great week and thanks so much for sharing your awesome post with us at Full Plate Thursday!